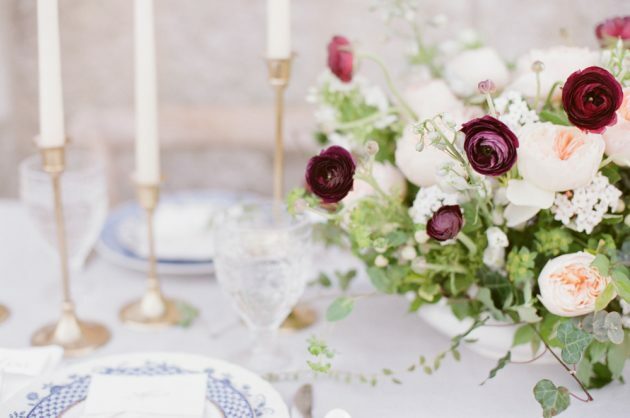 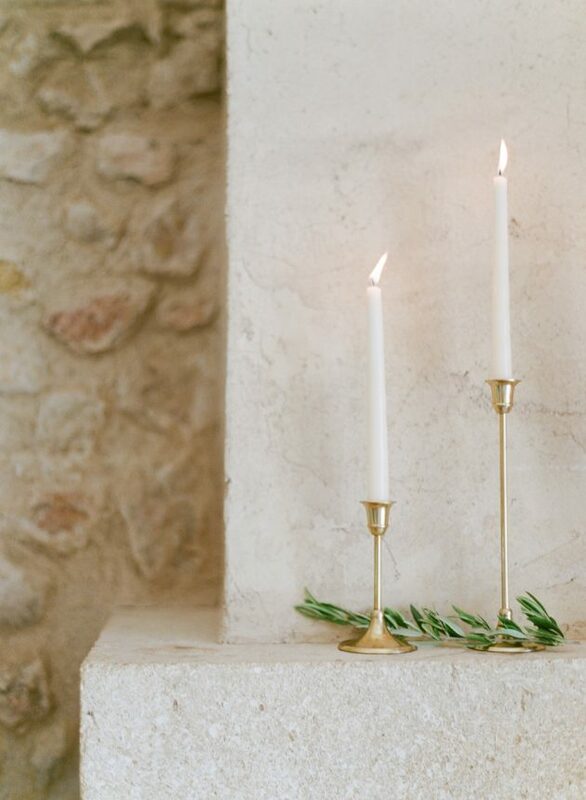 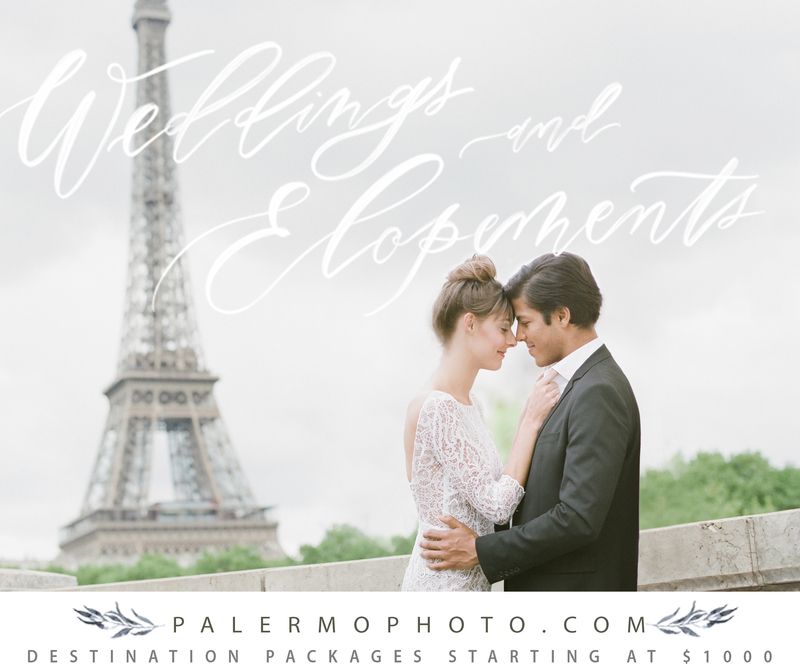 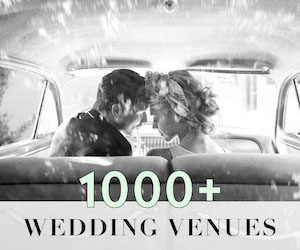 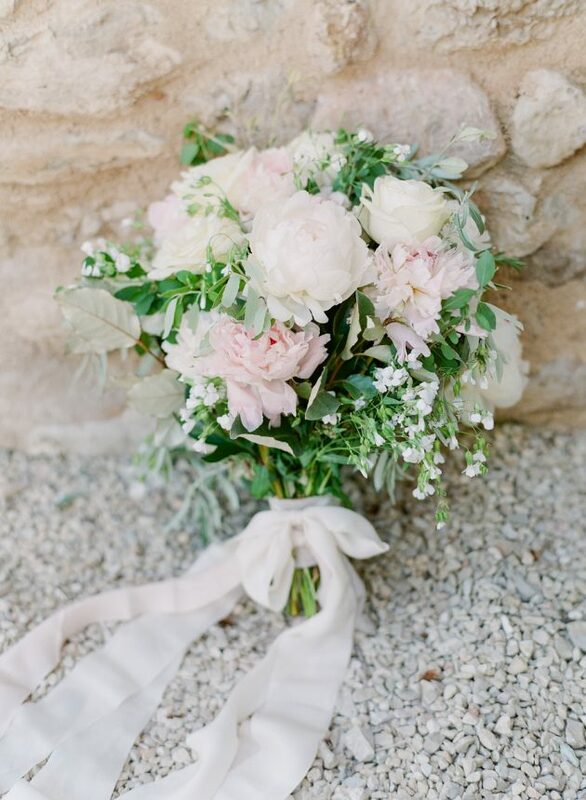 The vision for this shoot was to tell the story of an enchanting wedding at a Provencal farmhouse, with simple but elegant details created by the bride herself. 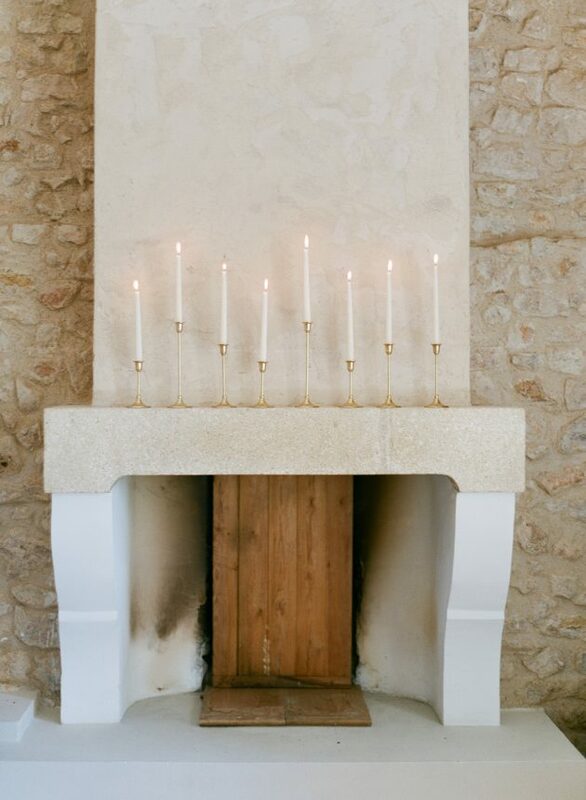 The setting is a 17th century private estate which offered a backdrop of rolling hills, sun-bleached stone walls, and the charm of the French countryside. 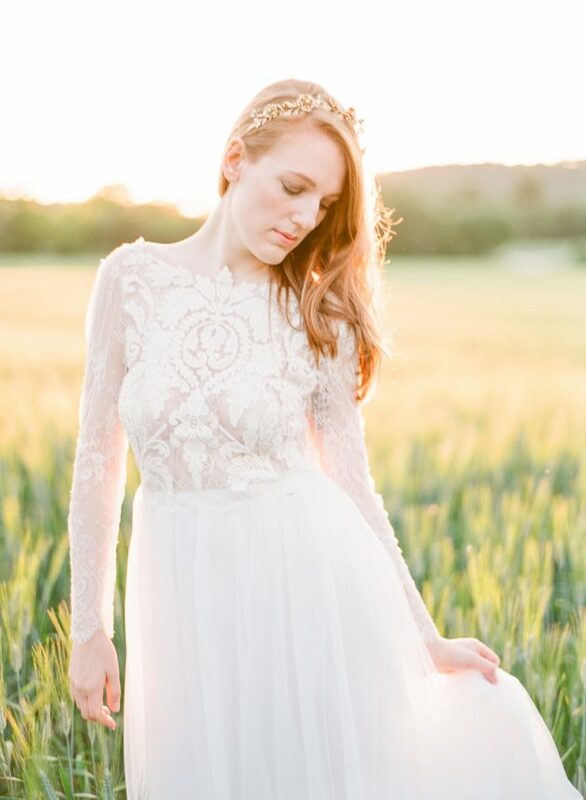 “Emily Kotarski hand-crafted the delicate gown with Chantilly and baroque French Alencon lace,” and the bride chose to do her own hair and makeup, consistent with the ‘handmade’ inspiration for this shoot. 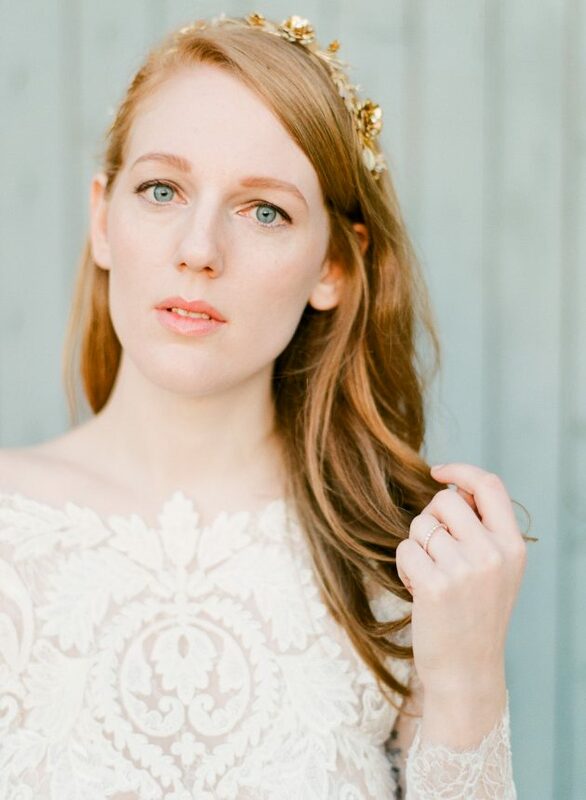 The crown from BHLDN added just the right element to finish her incredibly romantic look. 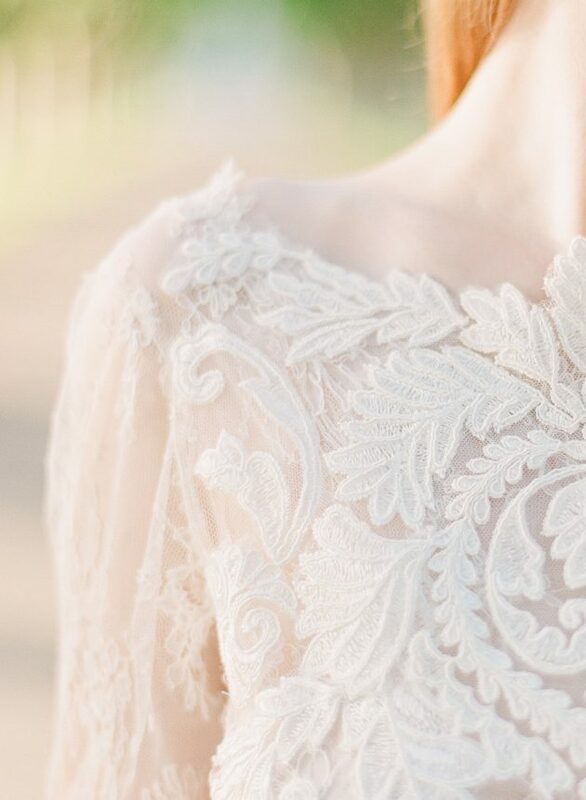 We’re so lucky that Molly Carr Fine Art Photography was there to capture every exquisite detail of this gorgeous shoot. 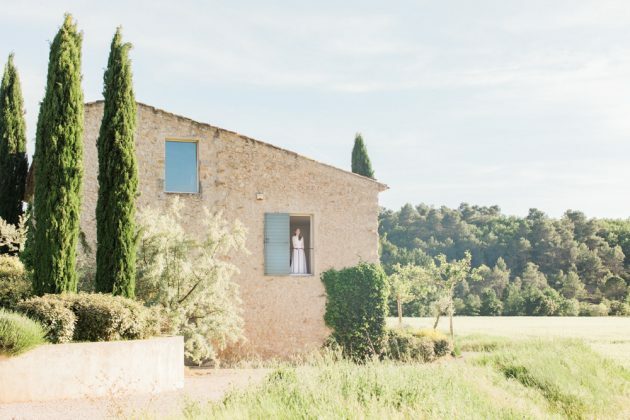 Nestled deep in the rolling hills of Provence, past fields of waving grain, through olive groves, and down tree-lined boulevards, Mas de L’Oliviére is a 17th-century Provençal farmhouse which served as the backdrop for the most beautiful of affairs. 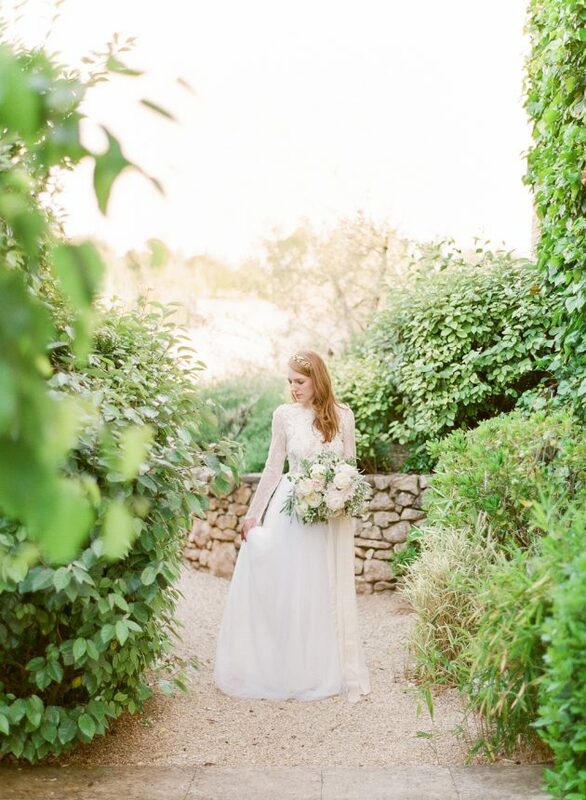 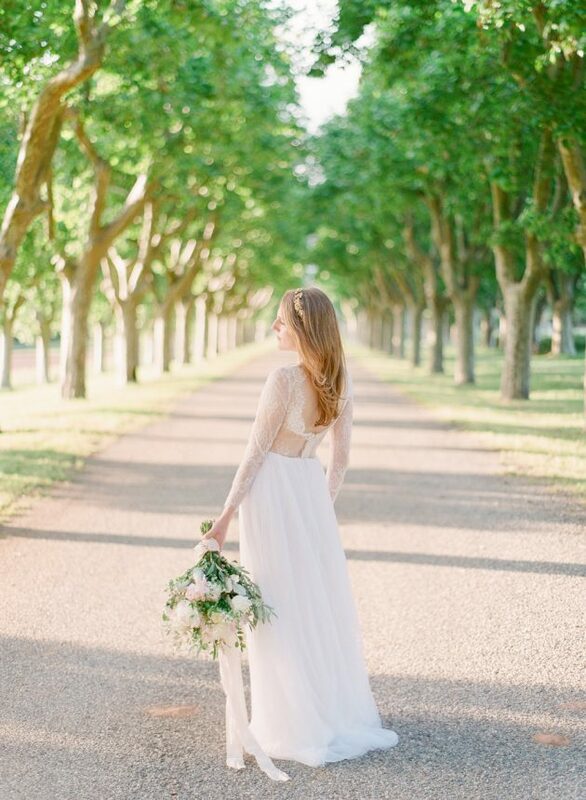 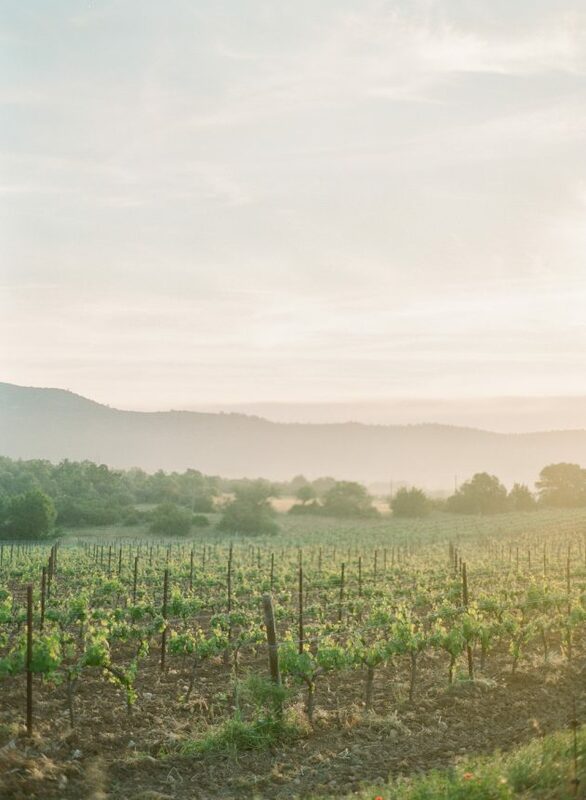 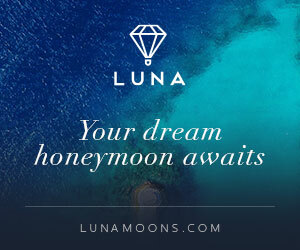 Inspired by the sun-bleached elegance of its stone walls and the bounty of the French countryside, this Provence wedding editorial tells a story of a bride who has lovingly handcrafted the most precious of moments leading up to her wedding day. 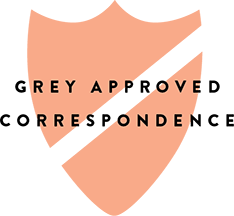 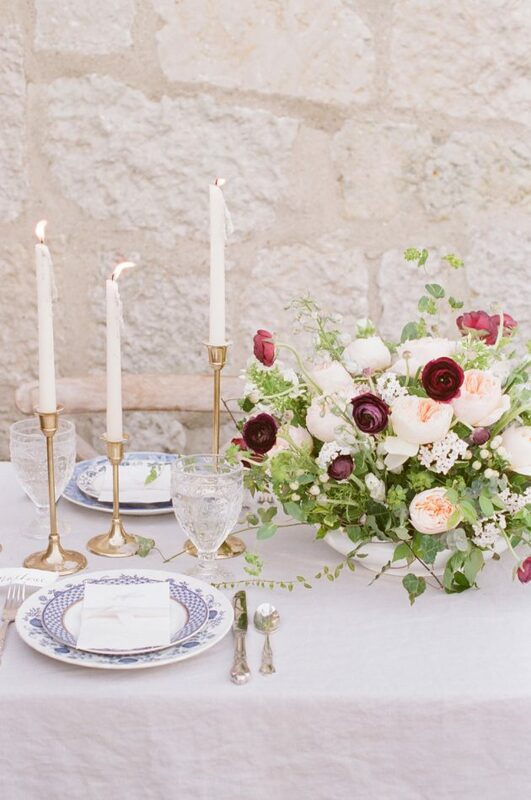 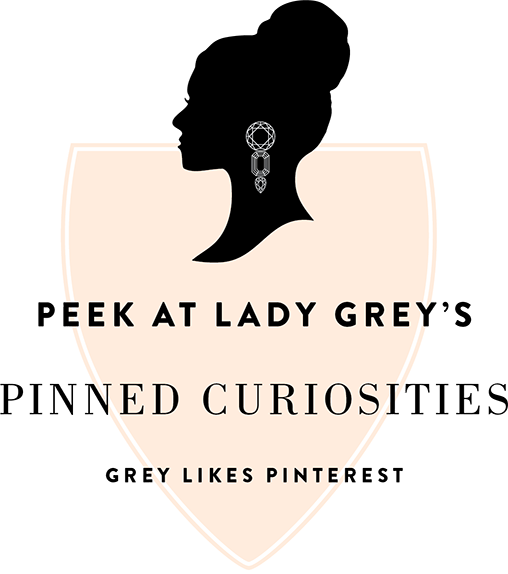 Months before she and her beloved were to elope, she explored sleepy Provençal villages, stopping into tiny antique shops, and, piece by piece, collecting her blue and white wedding china, her silver flatware, and her brass candlesticks. 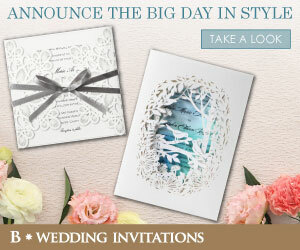 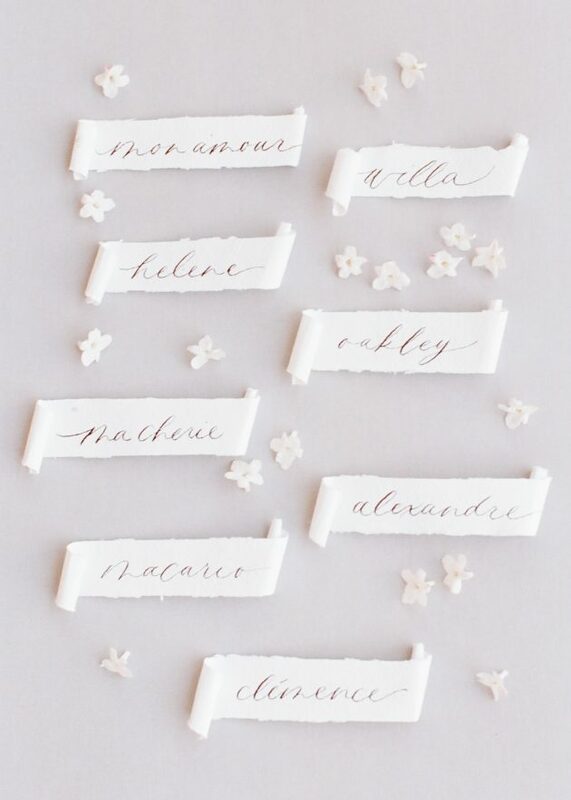 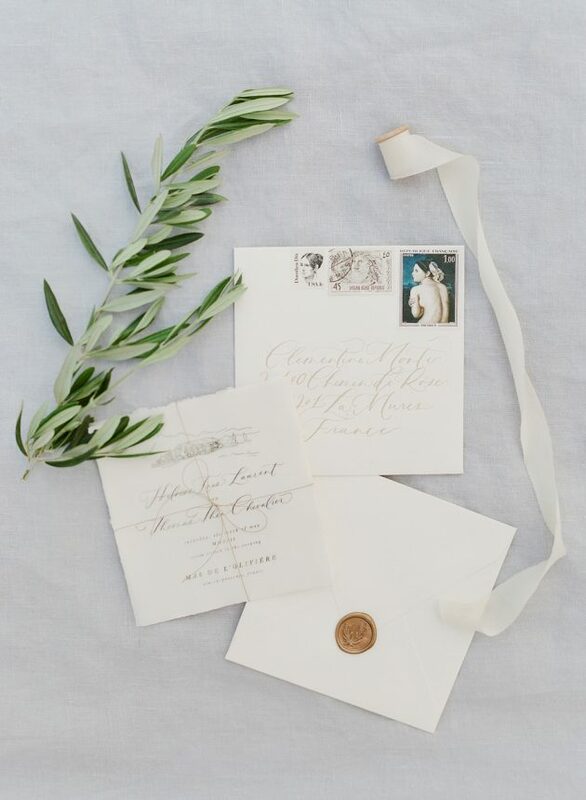 Artist and visionary, Shasta Bell Calligraphy, worked with her to design the paperie that would be sent to her most intimate group of guests who would stand alongside as she and her groom exchanged their lovingly-written vows. 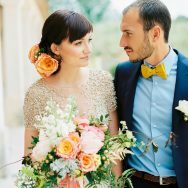 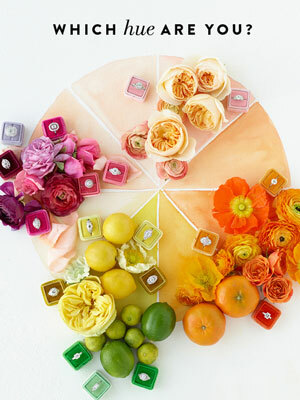 On the morning of her wedding day, she visited a local market to hand-source the wedding meal – a simple yet sophisticated Provençal spread of local fromage, cherries, fresh-picked apricots, honeycomb, and baguette. 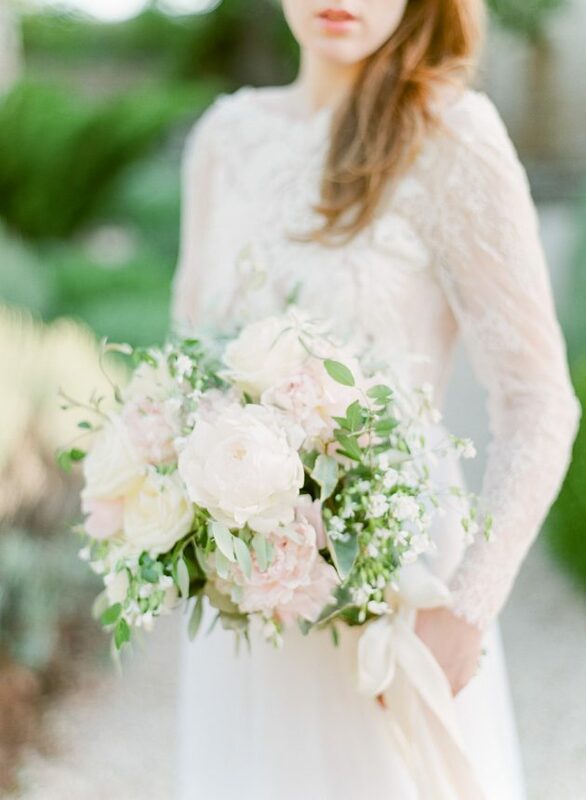 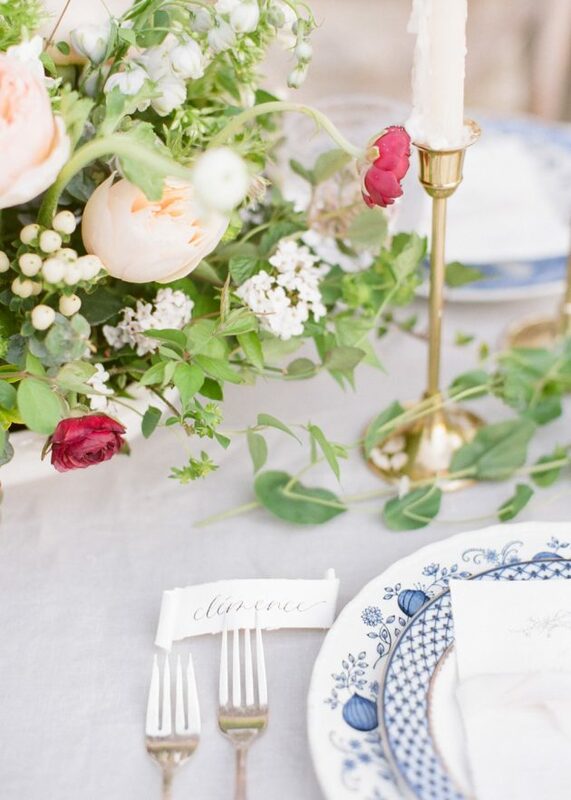 Upon returning to the stone farmhouse, she headed out on foot to forage for the flora and fauna that would adorn their table and her bouquet. 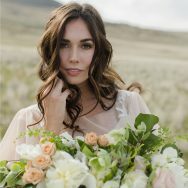 Keeping in line with the quiet ease of the day, the bride chose to style her hair and apply her makeup herself – a soft, romantic look with tousled locks and luminous skin. 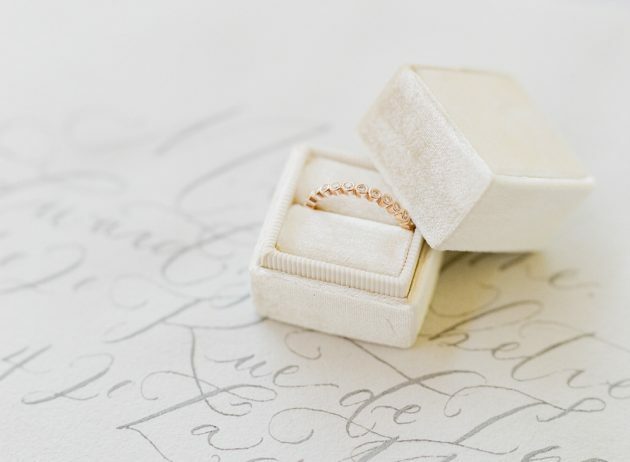 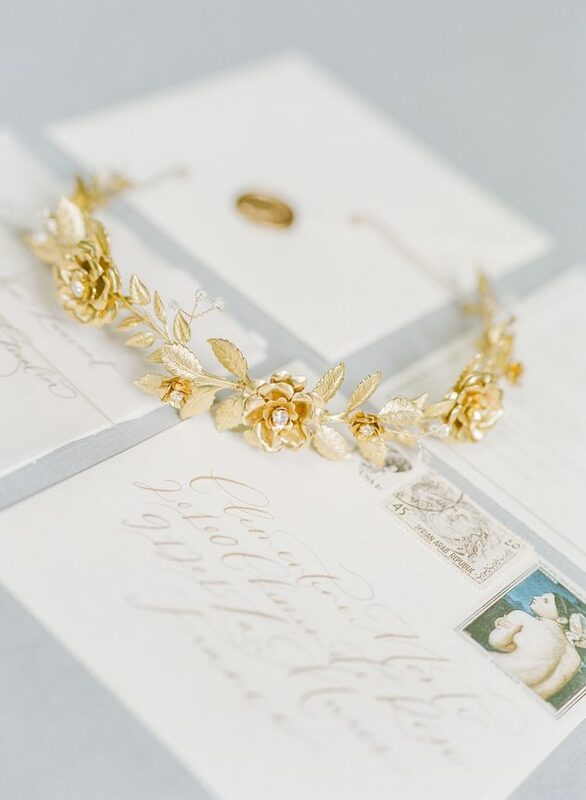 A golden crown from BHLDN was the perfect finishing touch to prepare her for the moment that she was to be wed.